Kinetic Letters teaches a way of holding the pencil that is comfortable and allows children to write fast and legibly. 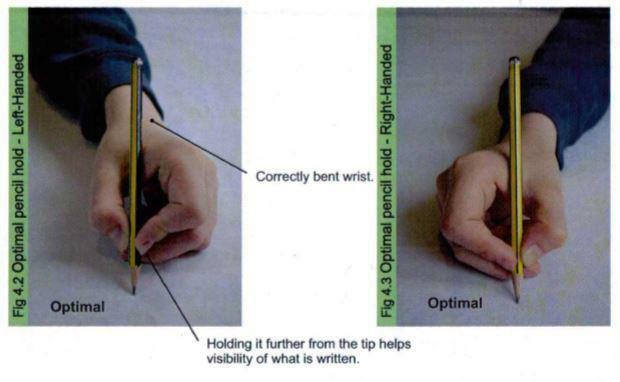 The strong lower half of the hand and the 'Resting Fingers', create a stable base of support on which the more dextrous fingers, 'The Three Friends', can manipulate the pencil. 1. 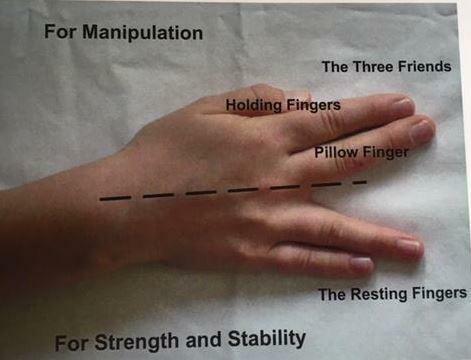 Are my 'Holding Fingers' level with each other? 2. Can I see a little pencil colour between my 'Holding Fingers'? 3. Is my 'Pillow Finger' underneath? 4. Is my pencil laying across my hand? Right and left-handed children use the same routine for picking up a pencil and placing their fingers around it. Left-handed children need to hold the pencil further from the tip than right-handed children to help them see what is being written. A 'blu-tac' caterpillar helps maintain the gap between the fingers as no one wants to squash a caterpillar!